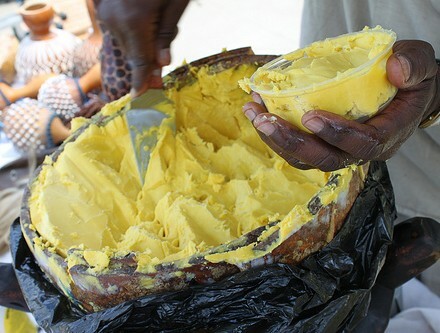 Oh The Joys Of Shea Butter!! One of the things I’ve discovered along my natural hair journey is shea butter. I don’t know why but my hair loves this stuff. It locks in moisture and really helps when it comes to detangling. I use it after ‘spritzzing’ my hair with water- trusty hair water bottle is a must with natural hair, it’s all about moisture- I make my own shea butter concoction, though I try not to use it too often because it does have a tendency to build up. I don’t really measure the quantities, but for one portion of shea butter I try to have at least four times less the amount of all the other oils. With vitamin E I tend to just have a few drops; a teaspoon at most added to the concoction…You’ll get to see a lot more of how I use shea butter and when. The number 6 best selling beauty product on Amazon.com this week is 100% Pure Unrefined Organic Raw SHEA BUTTER. (The one pound size for $7.00!) How pure is this stuff? Let’s look at the label. Not much of a label to look at, is there? That’s because this is a pure natural material (or as close as you’re going to get) and therefore it doesn’t have any of the standard extra ingredients you might find like solvents, preservatives, etc. Since there aren’t any other ingredients to review, let’s take a quick look at the components of shea butter. It’s primarily made up of fatty acids including palmitic, stearic, oleic, linoleic and arachidic. The stearic and oleic acids make up about 85–90% of the total fatty acids and their relative proportion controls the butter’s consistency. Higher stearic acid means it will be more solid than liquid and the higher the oleic acid, the harder that solid is. Both of these vary depending on the growing season and location. You can use shea butter on your skin and hair as it is and it will make a fine moisturizer. However, it won’t necessarily replace all your lotions and conditioners because it’s not as spreadable and it doesn’t contain other ingredients you would want in a skin lotion (like humectants) or in a conditioner (like anti-stat agents.) Still, if you want a natural product that will soften hair and skin, shea is a good way to go. And you can’t beat the price. Plus, it has a whole stadium named after it!